TTC 2019 was held in Vancouver, Canada on the campus of the University of British Columbia and hosted by TRIUMF on February 5 - 8, 2019. The LOC Chair was Bob Laxdal of TRIUMF. The workshop had 108 participants. The presentations and detailed schedule can be found under Timetable. The mission of the TESLA Technology Collaboration is to advance SRF technology R&D and related accelerator studies across the broad diversity of scientific applications, and to keep open and provide a bridge for communication and sharing of ideas, developments, and testing across associated projects. To this end the Collaboration supports and encourages free and open exchange of scientific and technical knowledge, expertise, engineering designs, and equipment. The TTC organizes regular collaboration meetings where new developments are reported, recent findings are discussed and technical issues are concluded. The schedule for the meeting follows the standard TTC format. The meeting includes plenary talks as well as parallel sessions for the working groups. Four working groups WG1 -> WG4 are defined with specified charges to help focus the presentations and discussions. This TTC meeting is hosted by TRIUMF and will take place on the University of British Columbia (UBC) Campus in the Student AMS Nest Facility on Feb. 5-8, 2019. UBC is on the western-most point of Vancouver about 20 minutes drive from the Vancouver International Airport (YVR) and easily reached by public transport. 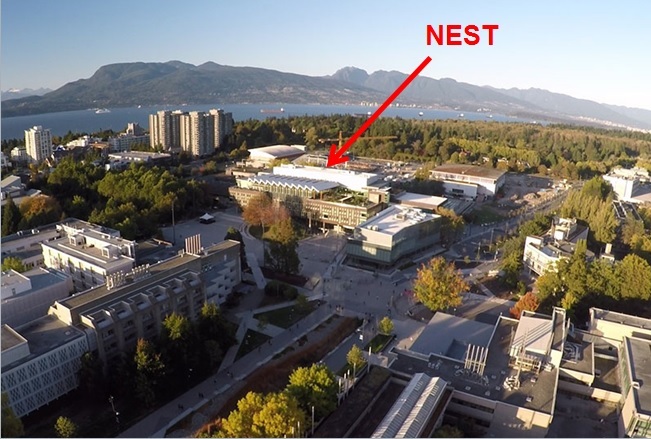 The AMS Nest is a large multi-purpose building for Student Services and UBC Conference Services. The building is in the central campus a few minutes walk from the UBC Bus Terminal and Parking Garages. The meeting will take place in AMS Nest Room 2306/2309. The two rooms will be used together for the plenary and separated for the working group sessions. The floor plan for the 2nd level of the AMS Nest is shown below. Tickets will be included in your registration badge for those indicating attendance. If you are travelling from outside of Canada, you may require a visitor visa or ETA to enter. Please refer to the Government of Canada website to confirm if you require a visitor visa or ETA and for instructions on how to apply. U.S. citizens carrying a valid U.S. Passport do not require a visa or ETA to come to Canada. However, U.S. residents carrying a passport from a country requiring a visitor visa will need to apply for a visitor visa. If you require a visitor visa, you will need an invitation letter from the LOC Chair. Send your request to Silke Bruckner silke@triumf.ca to request your invitation letter. It is important to submit your visa application as soon as possible. Allow sufficient time for processing. The processing time tool is available for an estimate of application processing times, but be considerate of possible delays. As of March 2016, any delegates from visa-exempt countries will need to apply for an Electronic Travel Authorization (eTA). The eTA costs $7.00 CAD, and allows for pre-screening of visa-exempt nationals. People can choose to stay on UBC campus (walking distance) or in Vancouver hotels. We have blocked rooms in two hotels within 30 minutes by bus. As well Downtown Vancouver (west-end) is about 45 minutes from UBC by transit or about 30 min by car with many rooms available. A limited number of rooms are available at these hotels until January 4, 2019 and reservations are accepted on a first come, first served basis. No breakfast available here. Breakfast can be had at the AMS Student Nest. 35 minutes by bus to UBC. 1 zone Fares within Vancouver are $2.95 (exact change for pay on the bus) or $2.30 if you have a COMPASS card (convenient tap in/out system) - see Translink site for details https://www.translink.ca/. For travel to the UBC Nest conference location the destination is `UBC Exchange'. For travel from YVR (Vancouver International Airport) to UBC take the `Canada Line' rapid transit and connect to westbound 49 at 49th avenue or bus 41 or 43 at 41st Avenue. The `Canada Line' also can be used to continue to Broadway or downtown for the satelliete hotels. A taxi from YVR to UBC is ~$35CND. For travel from Park Inn Vancouver (898 W. Broadway) to UBC take the UBC 99 B-line bus from Broadway/Willow to UBC (Terminus). It takes 30 minutes. For travel from Executive Hotel Vintage Park (1379 Howe St) to UBC walk to Burrard and Burnaby St and take Bus 44 to UBC (Terminus). It takes 35 minutes. There will be a TRIUMF tour on Friday afternoon. TRIUMF is at the south of campus about a 3km walk from the AMS Nest. An alternative to walking is TransLink Bus #41 which goes from the UBC bus loop Bay 7 (near Nest) with a stop in front of TRIUMF. There is also paid parking at TRIUMF.